I'm not a briefcase'y kind of guy but I got a present from my friend Hans a while back. A vintage Danish bus driver bag - standard issue for those public transport heroes. Leather but completely waterproofed and ready for any weather. 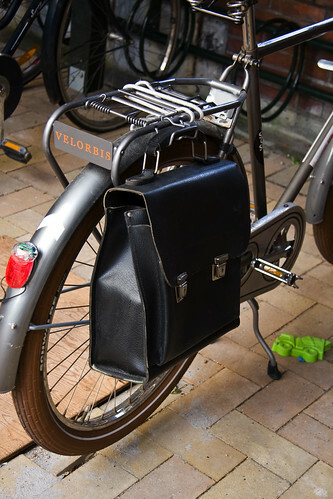 I'd been looking for a bag to hang on my standard issue hook on the back rack of my bicycle. Previously it was only diapers hanging there, on the way home from the supermarket. I've written about these historical hooks that live on in Copenhagen a while back. Now I've found a bag that I fancy hangin on mine.